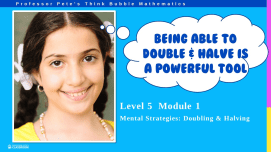 Once students have memorized all the basic multiplication and division facts, they are ready to extend their number fluency to handle more challenging examples. Teacher notes: Relating known number facts to larger numbers and decimals. Strategies can be applied to larger numbers in the future. Revision of all advanced multipliclation and division number facts. Set of 5 assessment tests to check on how students are progressing with each of the units in the Advanced Multiplication & Division Facts series of worksheets. Set of 10 homework sheets to match each of the sets in the Advanced Multiplication & Division Facts series. Contains information for parents. Doubling 2-digit numbers. Also includes revision of order of operations and all operations number facts. Doubling 3-digit numbers. Also includes revision of order of operations and all operations number facts. Halving 2-digit numbers. Also includes revision of order of operations and all operations number facts. Halving 3-digit numbers. Also includes revision of order of operations and all operations number facts.